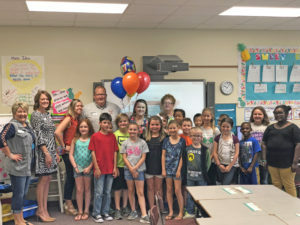 The Greater Cleveland Chamber of Commerce has recognized Cristy Speight as the May Super Star Teacher of the Month. Super Star teachers demonstrate excellence and leadership in their classroom, creativity and motivation of their students and show a high level of commitment to our community. Ms. Speight, a teacher at Polenta Elementary, consistently goes above and beyond to inspire her students every day. She has a true passion for teaching and loves teaching ownership of learning, looks for innovative teaching methods, and provides a positive learning environment. Meeting the individual needs of each student is very important to her as well as inspiring her fellow teachers. She can always be counted on to be positive, creative, and passionate. The Cleveland Chamber Super Star Classroom Goodie Bag was sponsored this month by the Cleveland Fire Department.